Thread: Running rig with anti tangle tubing ??? Re: Running rig with anti tangle tubing ??? The swivel should ‘not’ be too tight a fit into the end of the tubing, so that if the lead gets snagged the swivel will come completely free of the clip/tube, and the lead and tubing will subsequently slide off of the line after a break. Last edited by Keith M; 30-03-2019 at 20:07. I dont know if I am going nuts (probably..) but I could have sworn I remember this exact thread being done before. Anyway ...the idea of running leads on tubing became popular back in the 90s when Carpers like Julian Cundiff were writing about and using them. Basically a bead of some sort at one end of the tube and a lead with a big enough bored eye sliding up and down the tube and stopped by the bead. A backstop of some sort to stop the lead coming off the other end of the tube was also often added and this led to endless arguments about if the rig was safe or not. The majority (all?) did not actually act as running lead and it was basically working as a bolt rig. It seems a strange rule to have at a fishery. 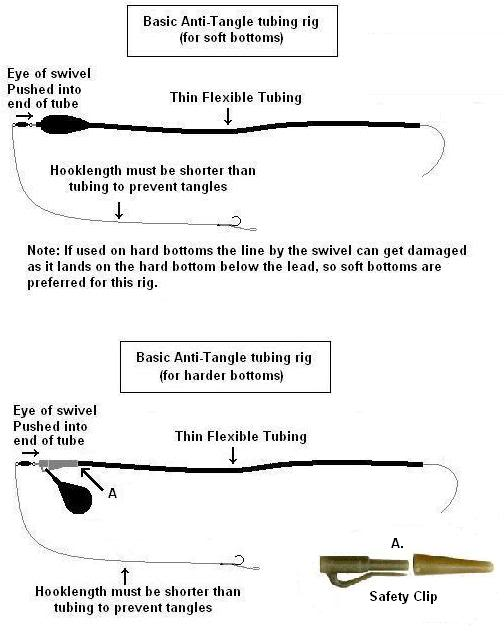 My mates and I have been developing and using anti tangle tubing and in-line leads since the very early 80’s when you couldn’t even buy such things in tackleshops and had to make your own. We also had to modify our original Optonics to add telephone speakers and latching and extension boxes to them because you couldn’t buy such things in tackleshops (this was quite a few years before Delkim started to sell their modified optonics). We never used backstops either, as apart from not being needed these can quite often prevent the lead from breaking completely free after a line break; and after a break it takes very little effort for our swivels to come free from the end of the tubing as long as you didn’t use swivels that were a little too tight. I don’t rely on safety clips working and have always made sure that my swivels don’t fit too tightly into the end of my tubing so that they will come free with very little real effort. Last edited by Keith M; 02-04-2019 at 14:07. Keith yes I think your absolutely right that backstops are bad news in allot of situations for exactly the reasons you mention. The line breaks then pulls through the lead link to the backstop which fails to come off and the fish ends up towing the lead. I even recall one manufacturer selling a readymade running rig that incorporated a backstop and then pushed the idea that this gave you the best of both worlds…it was both a running and a Bolt rig to outwit wary Carp. The fish would feel no resistance to start but then would hit the backstop and bolt !!!!! The running rigs I use dont have a backstop or any tubing either. Should the line break the lead simply falls off the line. Lead clips are an interesting one, and really need more than a sort forum post to cover everything. I believe it was Nash who came up with the original lead clip which you could fish as running or semi fixed. In the semi fixed context the swivel jammed in the clip as tight as possible. In fact Nash then updated later versions of the clip to include a hole in the barrel of the clip. The idea of that hole was to physically tie your swivel into the clip to ensure it could not come out and that the lead would instead pull free of the clip instead. The ease of which was governed by how hard you pushed the tail rubber onto the other end of the clip. I like lead clips allot but for my own part I use them only as a semi fixed setup.